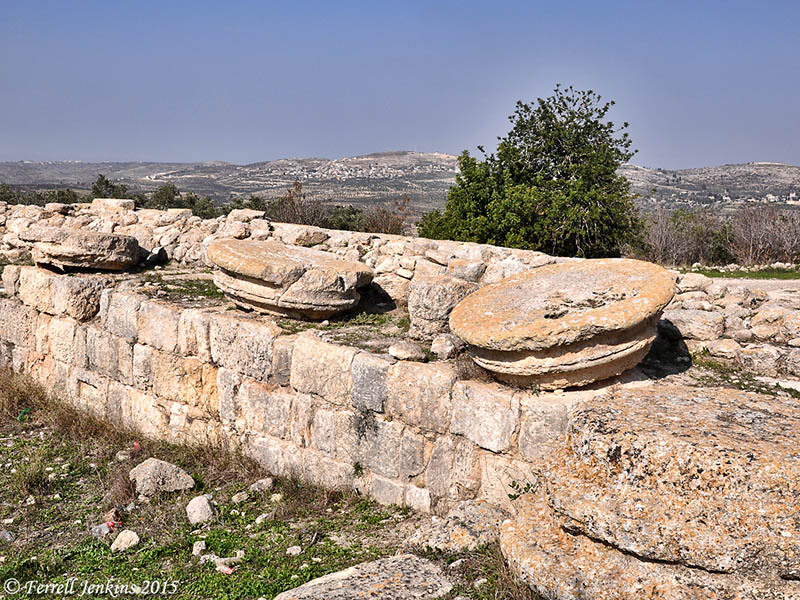 Samaria, the capital of the northern kingdom of Israel, was well known in Old Testament times. In New Testament times the term Samaria seems to be used of a region rather than a city. See Luke 17:11; John 4:4-7; Acts 1:8; 8:1,9,14; 9:31; 15:3. The city of Samaria had been rebuilt by Herod the Great and named Sebaste in honor of the Emperor Augustus. The modern name of the small town of Samaria is Sebastia. Herod the Great built a temple to Augustus with a monumental staircase over the palace area of the Israelite kingdom. The temple was destroyed, but later rebuilt along the same plan by Septimius Severus (Roman emperor, A.D. 193-211). The monumental staircase still stands at the top of the tell. Monumental steps from the time of Septimius Severus mark the site of Herod’s Temple to Augustus. Photo by Ferrell Jenkins. Some remnants of column capitals rest at the top of the steps. Remnants of some of the columns rest at the top of staircase. Photo by Ferrell Jenkins. This was the second of three temples erected by Herod in honor of Augustus. In two previous posts we have discussed the temple at Caesarea Maritima and the one in the district of Caearea Philippi (perhaps Omrit). IMHO we also need to give emphasis to the fact that Herod the Great had built three Imperial Cult Temples — all less than 40 miles from Nazareth/Capernaum. 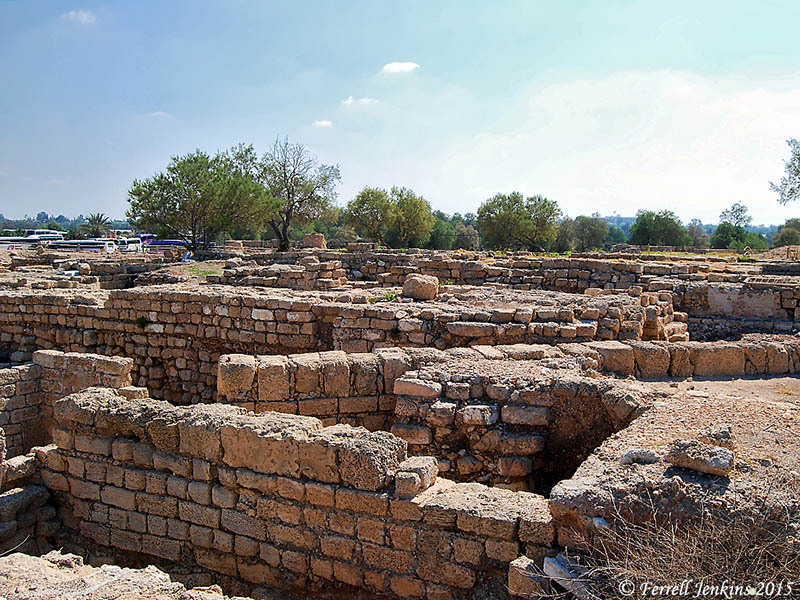 By the time that Jesus began his public ministry these Imperial Cult Temples (namely those at Caesarea Maritima, Sebastia, and the one near Caesarea Philippi [= Omrit]) had been in existence for over 40 years! In my recent lecture at the Florida College Lectureship I discussed two texts from the ministry of Jesus that may be understood in the light of the Emperor worship prevalent in the country. One was the location of Peter’s confession of Jesus: “You are the Christ, the Son of the living God” (Matthew 16:16 ESV). See a discussion here. The second text I used was the one involving the question, “Is it lawful to pay taxes to Caesar, or not?” (Matthew 22:17). More about that in a post to follow. We began this theme in the previous post with the temple Herod the Great erected to the emperor Augustus in the region of Caesarea Philippi. We pointed out that Herod had already built temples to the Emperor at Caesarea Maritima and at Sebaste (= Samaria). Caesarea Maritima was built on the site of Strato’s Tower and became a center of Roman provincial government in Judea. It was located on the main caravan route between Tyre and Egypt. The harbor at Caesarea was built by Herod and named Sebastos (Greek for Augustus) in honor of the Emperor. Our photo below shows the harbor and the location of the Imperial temple indicated by a red oval. The inner harbor extended over the grassy area, almost to the steps of the temple. When we first began visiting Caesarea it was thought that another building, north of the inner harbor, marked the site of the Augustus temple. It is now identified as a nymphaeum. 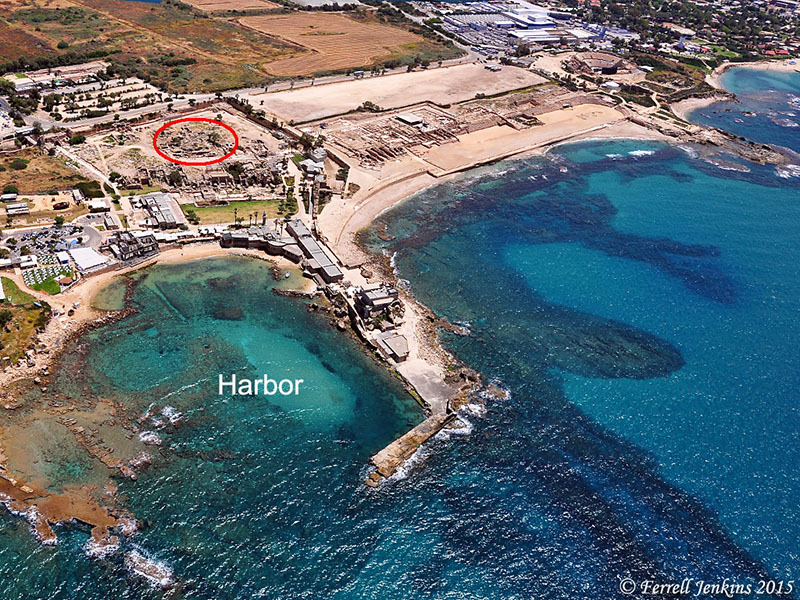 Aerial view of Caesarea Maritima showing the Sebastos harbor and the site of the Augustus temple. Photo by Ferrell Jenkins. The excavation of the Temple Platform began in 1989 under the direction of Kenneth G. Holum of the University of Maryland. Holum says the temple of Augustus was torn down about 400 A.D. with most of the stone being used in others buildings. The scant ruins enable the archaeologists to determine that the temple measured 95 by 150 feet. He says it towered “perhaps 100 feet from the column bases to the peak.” The temple was made of local sandstone, called kurkar, and coated with a white stucco. The Temple Platform was covered by an octagonal Byzantine church in the 6th century. Those are the ruins we see today within the Crusader city. The 6th century Byzantine church was erected over the earlier temple to Augustus. Photo by Ferrell Jenkins. A sign at the site of the Temple, already stained in 2005, provides some indication of the appearance of the building. 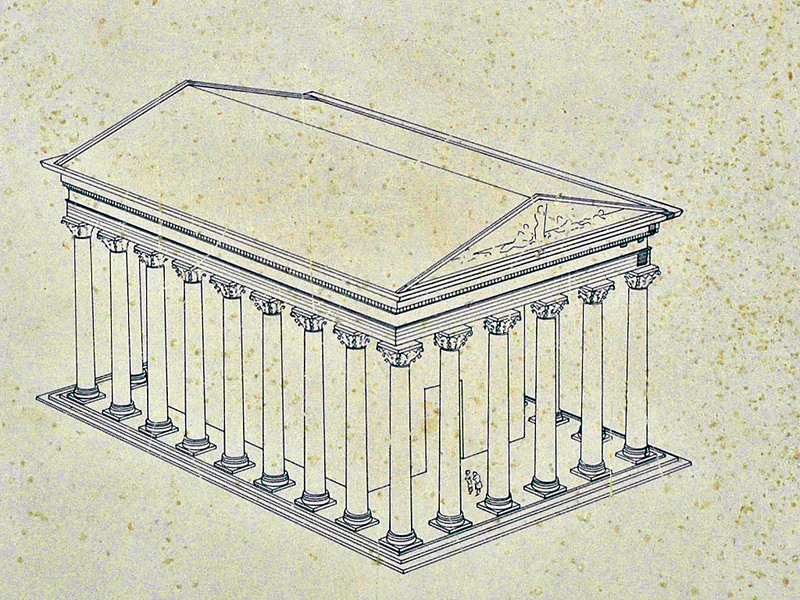 An artists’ reconstruction of the Temple of Augustus at Caesarea Maritima. Photo by Ferrell Jenkins. 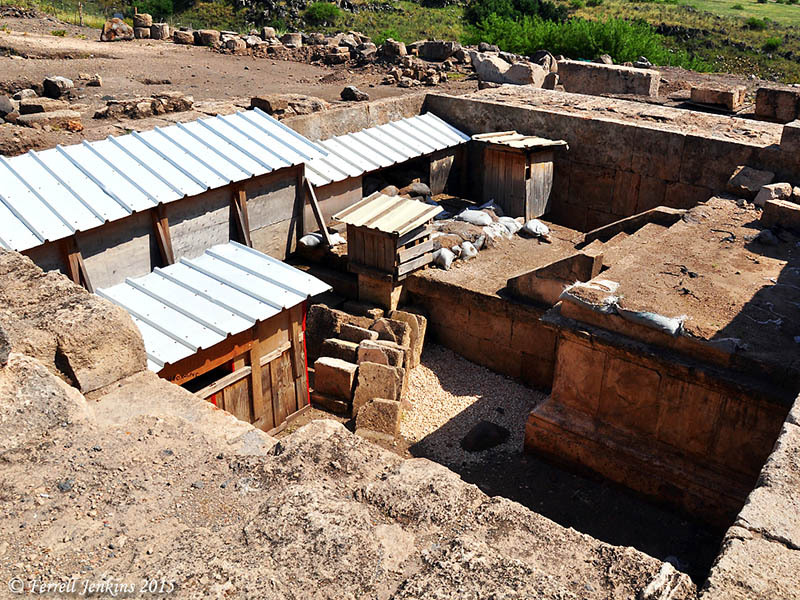 The article by Kenneth G. Holum appeared in an issue of Biblical Archaeology Review (September/October 2004) devoted to “Herod’s Fun City.” His article is entitled “Building Power: The Politics of Architecture.” There are numerous photographs and diagrams. Charles Savelle left a comment to the previous post in which he called attention to a few additional sources here. I was especially pleased to see a reference to Caesarea Philippi: Banias the Lost City of Pan by John Francis Wilson. Speaking of the temple at Paneion, he says that the building itself would be scandal enough from the point of view of the Jews in the area. Wilson states that Herod set the course for Imperial Worship in the east. When we think of Caesarea we recall the major events recorded in the book of Acts. The residence of Pontius Pilate, prefect of Judea (A.D. 26-36), though there is no reference to this fact in the New Testament. The visit of Peter to preach the gospel to the Roman Centurion Cornelius (Acts 10-11). The visit and death of Herod Agrippa I (A.D. 37-44; Acts 12). The imprisonment of the apostle Paul (A.D. 58-60; Acts 23-26). We plan to say more about Pilate and his role in upholding the Imperial Cult in Roman Palestine in another post. Herod supported Mark Antony against Augustus in the Roman civil war. When Augustus was victorius at the battle of Actium (31 B.C. ), Herod convinced Augustus that he was loyal to him. Herod, who already ruled Judea, was granted authority over Galilee and Iturea. “In turn, Herod ingratiated himself to Augustus by building monuments and temples in the emperor’s honor. Temples dedicated to the emperor in the early Roman period (20 B.C.E.–120 C.E.) were part of an empire-wide phenomenon known as “the emperor cult.” This Roman imperial institution played a pivotal role in spreading imperial propaganda and encouraging allegiance to the emperor, who was portrayed as a god, or imbued with the spirit of a deity. (Overman, Olive, and Nelson,“Discovering Herod’s Shrine to Augustus.” BAR 29:02). Herod erected three temples to Augustus: (1) Caesarea Maritima; (2) Samaria, which he named Sebaste, Greek for the Latin Augustus; (3) Near Paneion (Caesarea Philippi; Banias] at the fountain of the Jordan (JW 1:404). We are concerned here with the third temple near Panion (Paneion). We know the same site as Caesarea Philippi because the city was built by Herod Philip and named to honor Caesar and himself. Excavators at Caesarea have identified a structure there, at the entrance of the cave, as the temple to Augustus. Other scholars suggest that this is part of a monumental entrance to the cave of Pan. Josephus’ expression “near the place called Panion” [Banias, later Caesarea Philippi] indicates a place closer to the Pan temples. However, the Greek term used in Matthew 16:13 (meros) can be translated district, region, or geographical area. 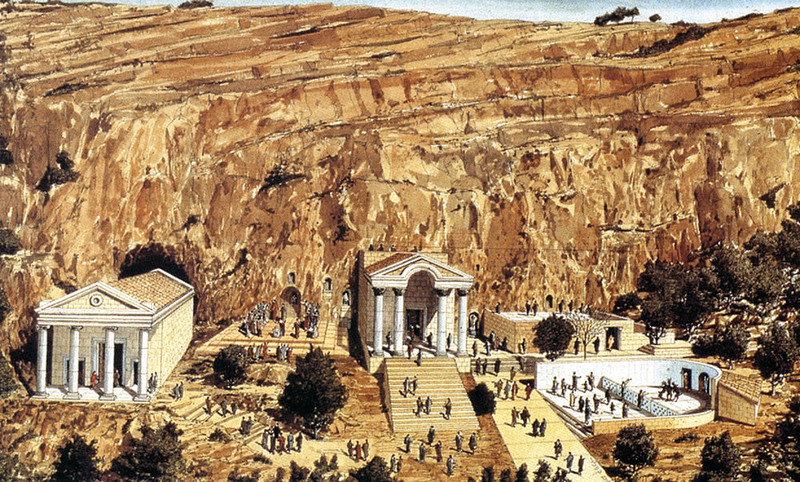 In the drawing below we see an artistic reconstruction of the Pan temenos at Panias (Banyas). The Temple to Augustus is the building on the left that backs up to the cave. Reconstruction of the Pan temenos at Panias. From Archaeological Sites in Israel, published by the Israel Information Center, Jerusalem, 1998. 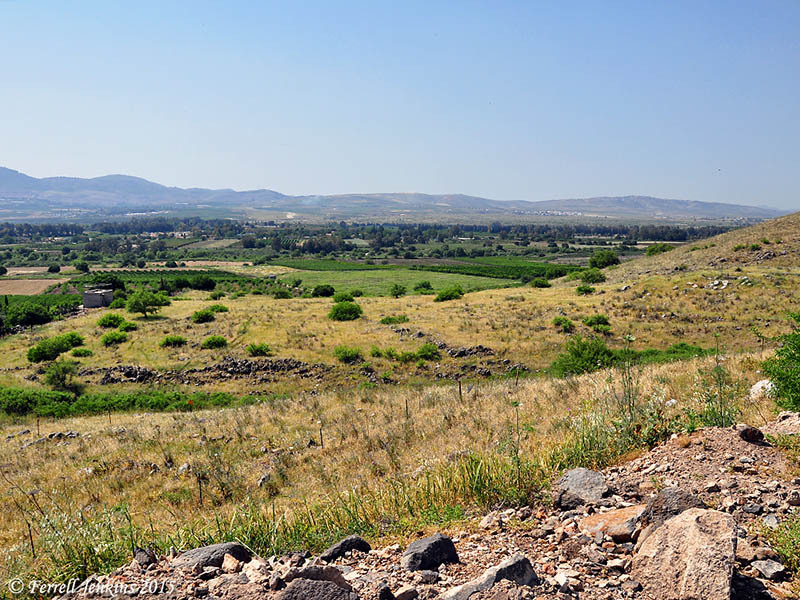 Archaeologists from Macalester College and Carthage College, working since 1999, have suggested that the third temple was built at Omrit, about three miles southwest of Banias on a bluff overlooking the Hula Valley from the east. If this is correct, then this may be the site of Caesarea Philippi (Mt. 16:13; Mk. 8:27). Currently the site of Omrit is practically impossible to reach by car, but you can reach the area and then walk to the excavation. View of the site of Omrit from the south. Photo by Ferrell Jenkins. If we look West from Omrit we have a good view of the northern end of the Hula Valley. A view NW to the Hula Valley from Omrit. Photo by Ferrell Jenkins. According to the excavators, a total of three ornate Roman temples were built at Omrit over a period of about 120 years. The steps we see below belong to the third temple erected near the end of the first century A.D.
Temple steps at Omrit. Photo by Ferrell Jenkins. The photo below looks below the ground level to the earlier temples or monumental buildings that are now covered to protect them. The earlier temples at Omrit. Photo by Ferrell Jenkins. A brochure, Omrit A Unique Archaeological Site in the Upper Galilee, is available in PDF here. Note that it presents the viewpoint of the excavators that this is the site of Herod’s Augusteum (p. 5). In “Debate: Where Was Herod’s Temple to Augustus” BAR 29:05 (Sept./Oct. 2003), Andrea Berlin argues that Banias is still the best candidate for the Augustan temple. Overman, Olive, and Nelson reply and reaffirm their preference for Omrit. 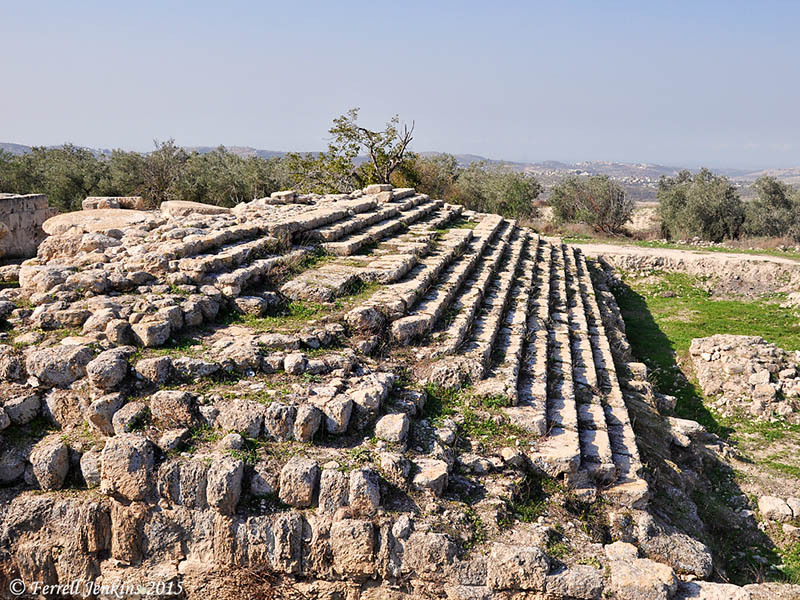 A third suggestions is made by the late Ehud Netzer that an opus reticulatum (latice-type stone work) building at Banias is the site of Herod’s temple to Augustus. This site is about 100 yards west of the Cave of Pan. Carl Rasmussen calls Omrit his favorite site in Israel here. 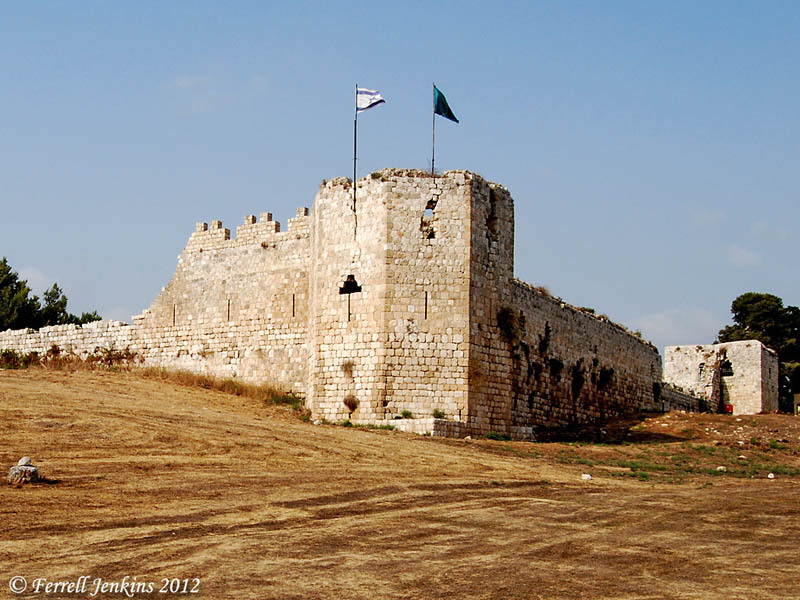 One of the significant battles between Israel and the Philistines took place during the time of Samuel when the ark of the covenant was located in the tent of meeting at Shiloh. Israel encamped at Ebenezer, and the Philistines encamped at Aphek in the plain of Sharon. This indicates that the two places were fairly close to each other. Aphek is located about 21 miles west of Shiloh. Ebenezer is about 2 miles east of Aphek. 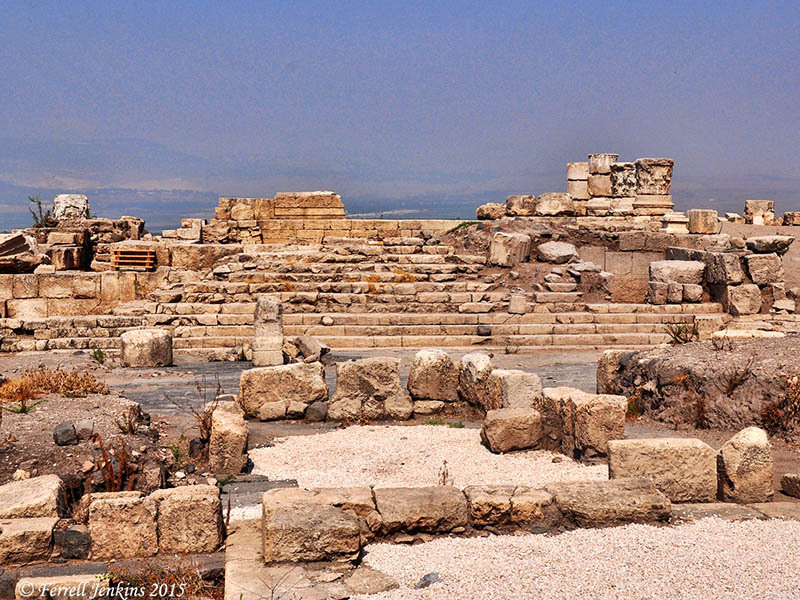 Herod the Great built a city at the site of Aphek and named it Antipatris in honor of his father. Because Aphek/Antipatris sat on a major south-north and west-east routes, it was dominated by many nations. The dominant feature of the site today is the Turkish fort. Inside are the excavated ruins of buildings from Canaanite to Herodian/Roman times. The apostle Paul stayed overnight at Antipatris on his journey from Jerusalem to Caesarea (Acts 23:31). 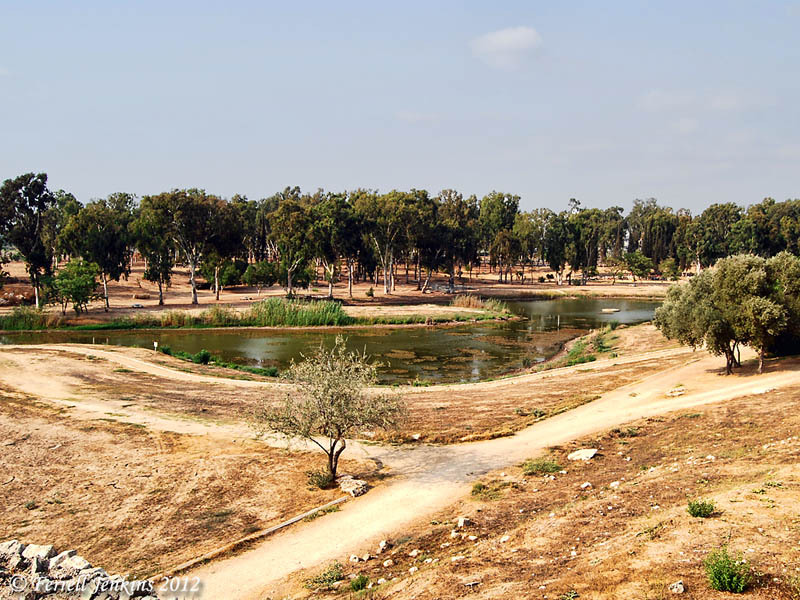 Aphek/Antipatris is known by the modern name Ras el-Ain because it is located at the headwaters of the Yarkon River which flows into the Mediterranean about 11 miles to the west. Source of the Yarkon River at Aphek/Antipatris. Photo by Ferrell Jenkins. Aphex/Antipatris is now dominated by the ruins of an Ottoman fortress. The Ottoman fortress at Aphek/Antipatris. Photo by Ferrell Jenkins. 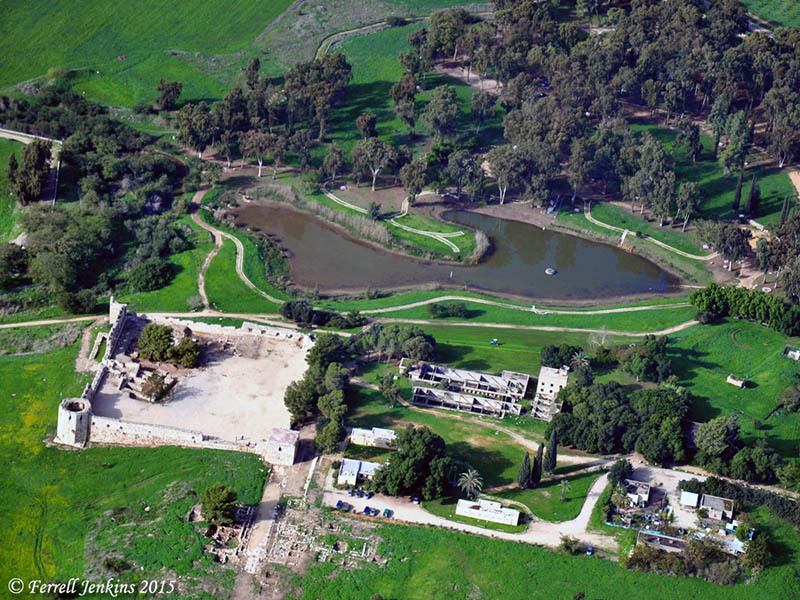 Our final photo shows the fortress and the source of the Yarkon River from the air. Notice in the previous photos the grass is brown. Those photos were made in August. The next photo was made in December and the grass is green. Aerial photograph of Aphek/Antipatris. Photo by Ferrell Jenkins. Leon Mauldin has written about Aphek here. 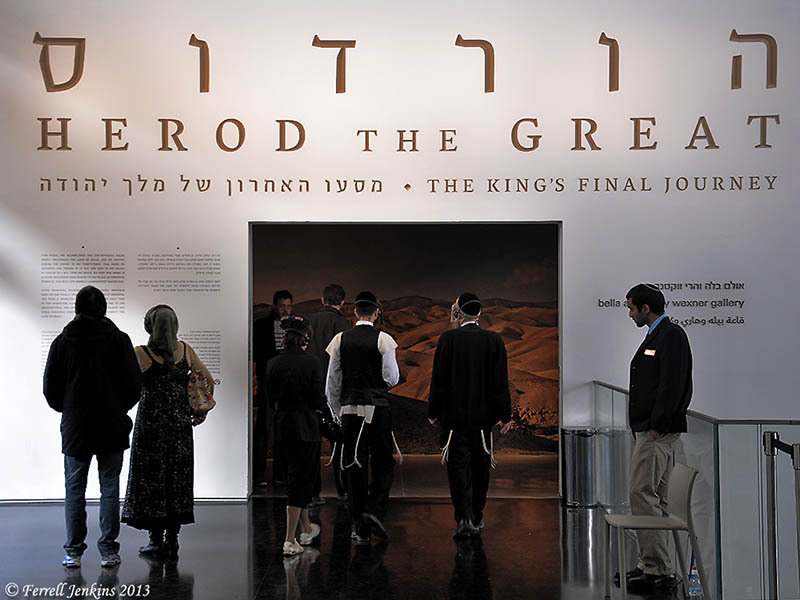 The Israel Museum exhibition of Herod the Great: The King’s Final Journey is scheduled to continue through January 4, 2014. This is a wonderful exhibit. If you can’t make it by the deadline, you may take a gallery tour here. This includes photos, drawings, explanations, and videos that walk you through the exhibit. Entrance to the Herod the Great exhibit in the Israel Museum. For additional information about Herod and some of his building projects, see here, here, here, and other places. Leen Ritmeyer was with a group allowed to make some photos within the exhibit. Read about it here. Most of our visits today were north of the Sea of Galilee. Here are some of the stop we made. The fishing port of Tiberias, where we saw fishermen bringing in some large fish. One of the owners of the Ron Beach Hotel told us these large fish were used for fish oil. Senir (Hasbani) River. One of the sources of the Jordan. Dan. To photograph the Middle Bronze city gate (19th-18th century B.C.). Beit Ussishkin Museum at Dan. The museum is mostly about the flora and fauna of the region, but there are a few pieces from the Dan excavations. Hermon Stream Nature Reserve (or Banias River). To see the waterfall. Omrit. Site of possible Herodian temple to Augustus. The road is horrible, and there is still a long walk to visit the site. It is really not prepared or intended for the casual visitor. Someday it should be. Abel-beth-maacah (or Abel of Beth-maacah). A city called “a mother in Israel” (2 Samuel 20:19). We had a view of Mount Hermon with a small amount of snow still on the top. 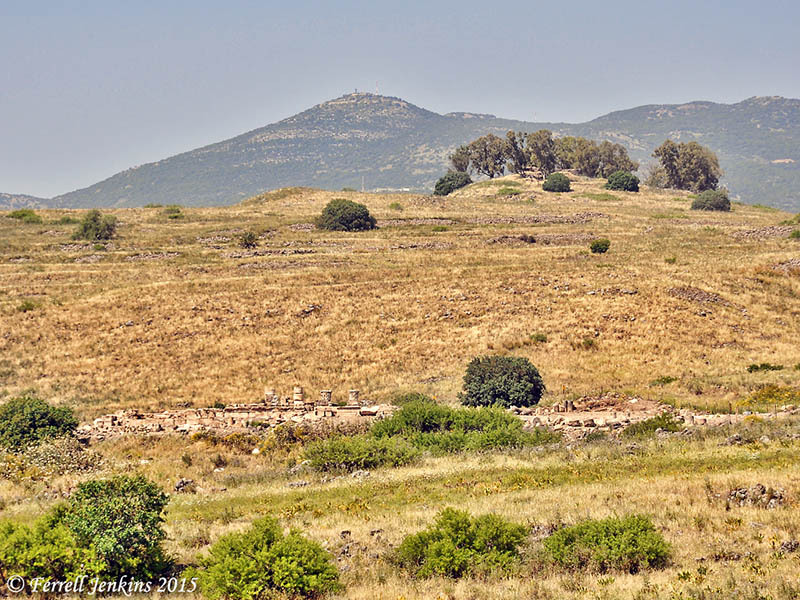 Abel-beth-maacah and Mount Hermon. View toward east. Photo by Ferrell Jenkins. Metula. This Israeli town is on the border with Lebanon. We looked over into Lebanon. Hula Lake/Agamon Lake. This is the restoration of a portion of Hula Lake that had been drained in the mid-20th century. Birds from Asia and Europe travel through the Great Rift and their way to Africa and back. This lake is a favorite stopping place for many of them. It was a hot day, but an enjoyable one. Shmuel Browns is an Israel Tour Guide. While he can handle any tours in Israel, he seems to specialize in taking care of individuals or small groups. Shmuel and I had not met till today, but we have come to know each other through our blogs and occasional correspondence. We decided to meet in person. This morning Shmuel picked up Dan and me at the hotel. Last evening we had discussed where we might go to make some good photos. Several places were discussed, but we decided on the Herodion. Shmuel has developed a one day (or less) program to take a person/group to the Herodion, and then to see the Herod the Great exhibit at the Israel Museum. I had been to the Herodion several times but had never spent much time in the lower Herodion. I was impressed with the things Shmuel showed us there. In the photo below he is explaining about a large Mikve (ritual bath) that was part of the complex built by Herod the Great. 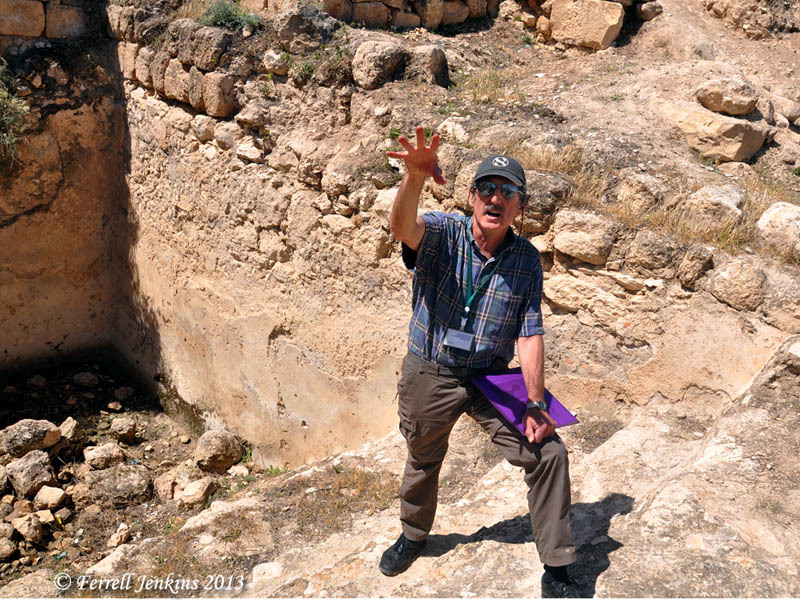 Shmuel Browns, Israel Tour Guide, at the Lower Herodion, Photo: Ferrell Jenkins. On the way to the Herodion we stopped on the north side of the Mar Elias Monastery. The Greet Orthodox Monastery overlooks Bethlehem and the Herodion. 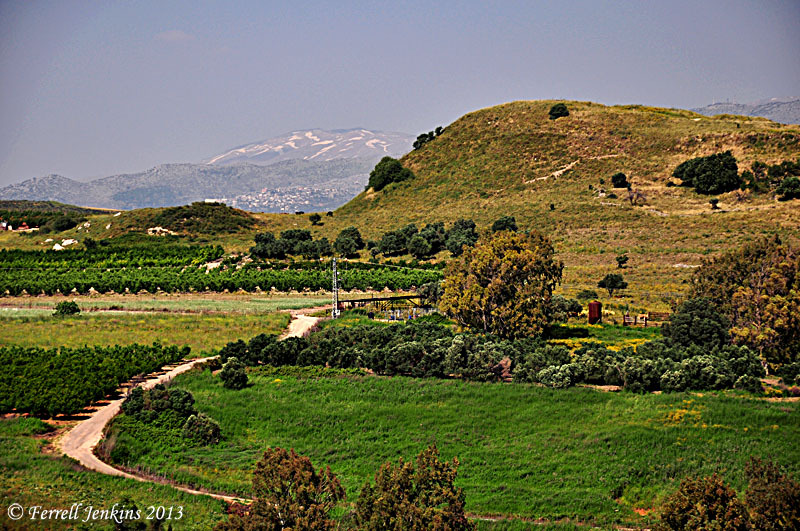 Tradition has it that it is here where Elijah rested when he was fleeing from Jezebel (1 Kings 19:2ff.). It is also associated with more recent historical characters with the name Elias. Across the road (north) is the ruin of the Kathisma (seat), an octagonal Byzantine church building discovered in 1992. A large stone in the center of the church is said to be where Mary rested on her way to Bethlehem (Luke 2:4-5). (Perhaps more about that later.) In the same area there is an old Olive grove. I enjoyed the beauty of this scene and thought you might also. 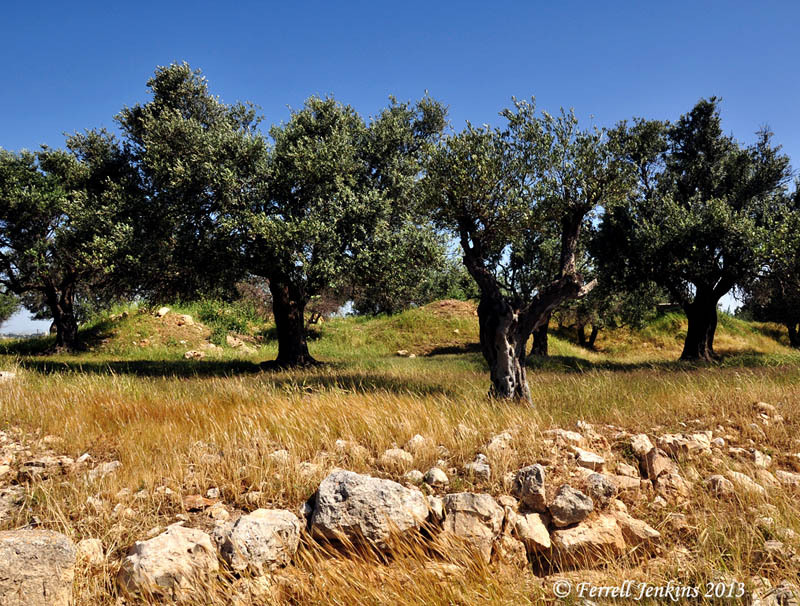 Olive trees near the Kathisma church. Photo by Ferrell Jenkins. Shmuel has a nice web site with some great photographs. He also sells prints of his photos. Read all about it at Israel Tours | Israel Tour Guide. From time to time I have someone who tells me they will have a free day or two while traveling in Israel on business. They want to know what they can see, or who could guide them. You need a guide in Jerusalem if you have never been there before. Shmuel would be a good man to call. All contact info is on his web page. I did not inquire about the costs, but you can check that when you contact him. We had a great morning. Thanks, Shmuel.